I am pleased to announce a new project for the Napoleon Series. 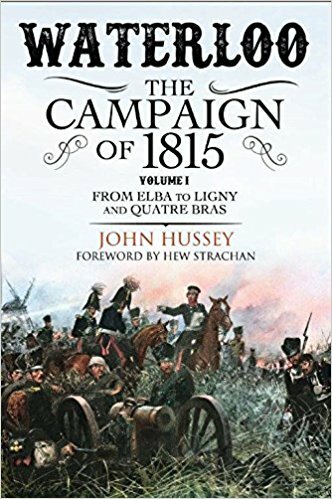 We have joined with Greenhill Books in their campaign to spread the news about a new book by John Hussey called Waterloo: the Campaign of 1815. About six months ago, Michael Leventhal contacted me and asked if I would take a look at an important new work on Waterloo that Greenhill Books was publishing. My first reaction was "oh great. . . not another book on Waterloo". But I agreed and as soon as I started reading it, I was hooked. It is not your typical Waterloo book. Although it covers the main topics I have come to expect in any volume on Waterloo, its main focus is not at the tactical or grand tactical level. Insted it examines in great detail many issues that are glossed over by most books. Mr Hussey tells the strategic side of the events of 1815 from the perspective of the national governments and their army commanders. It is packed with information on the problems the allies faced with coalition warfare and coordinating national objectives, as well as the issues both the allies and the French faced, such as national politics, logistics, intelligence, and communications. "No-one knows more about the Waterloo Campaign than John Hussey, and this extraordinary book is the culmination of his life’s work in Napoleonic War studies. He is able to deal with the big geo-strategic overview of the Hundred Days but also the arcane and intricate issues such as the d’Erlon Fiasco with equally masterly comprehensiveness. It will be decades before this book is superseded as the best account of those extraordinary events of 1815." The publisher is so confident with the quality of the book, he has provided advance copies of four chapters to the Napoleon Series so that our members can see what all the hype is about and decide for themselves. I also spent a month interviewing Mr. Hussey. He freely answered numerous questions on why he wrote the book, he reasons for taking the direction he did, and why he included what he did. Additionally, over the next two months, as part of the Napoleon Series updates, which are on the 15th and last day of the month, we will provide several things, including a new chapter and a continuation of the interview. Should you have a question for Mr. Hussey please send it to me and I will try to work it into the interview. Some of you may ask why did I not just write a review of the book? A valid question. One reason is because the publisher has offered every member of the Napoleon Series a 15% discount on the price of the book if they order the book through the link below. Furthermore, the Napoleon Series will receive a 10% commission for every book bought by a reader of the Napoleon Series. Information on how to order the book can be found below. © 1995 - 2017, The Napoleon Series, All Rights Reserved.